Modern-day camping in a motorhome, travel trailer, or fifth wheeler can be an enjoyable and relatively inexpensive way to travel. But, it can also turn into a costly nightmare when new RVers experience mishaps that turn anticipated ventures into regrettable misadventures. Don’t Back into the Palm Tree! Real Life Lessons for New and Wannabe RVers is the author’s personal confession of the mistakes she and her husband made during their first years of RVing. Accompanying those admissions in this book are recommendations and checklists for new and wannabe RVers so that they can avoid first-timer blunders. Don’t Back Into the Palm Tree! addresses all of the topics relative to new or wannabe RVers as they contemplate purchasing a recreational vehicle, taking their first trip, traveling with pets, making repairs and remodeling, and dealing with the inevitable “Murphy’s Law”—What can go wrong will go wrong. 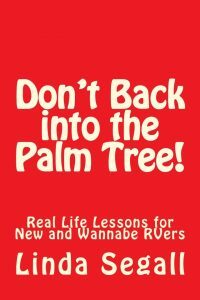 This book does not instruct the new RVer on how to attach sewer hoses, hook up water, dump tanks, install solar panels, or make simple electrical repairs (all very important things to know). Rather, it provides a very readable, basic yet comprehensive, guide for new RVers.